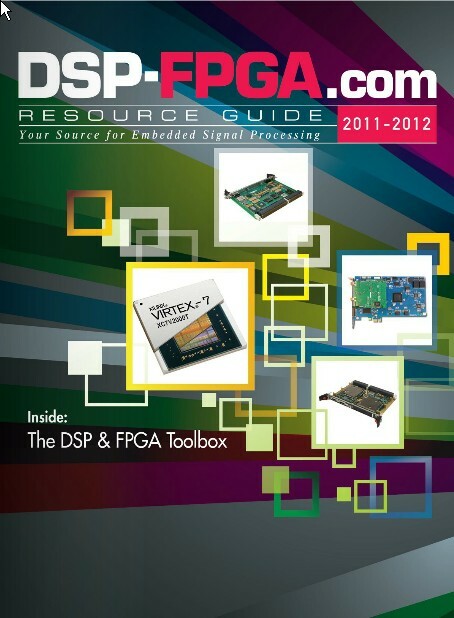 The 2011-12 edition of the DSP-FPGA Resource Guide is now available online from OpenSystems Media. Designers of embedded signal processing systems will find a wealth of reference material and product profiles in the guide on the latest Development Tools, DSP Board-Level Products, FPGA Hardware, and FPGA & CPLD ICs. for ARM-based FPGA design", I discuss how a combination of EDA tools and hardware prototyping platforms is enabling software engineers to get a head start on developing applications for the new generation of ARM-core based FPGA SoCs. In his feature on "Approaches and tools for FPGA mixed-signal integration", Allan Chin, CEO at Stellamar, compares three options that are available for designers who need to integrate Analog to Digital Converters (ADCs) with FPGAs: external off-the-shelf components, “mixed-signal” FPGAs, and digital ADC implementation. Roger Do, Senior Technical Marketing Engineer at Mentor Graphics, describes his company's Precision High-Rel solution for the problem of radiation-induced upsets and soft errors in FPGAs, in: "New tool for FPGA designers mitigates soft errors within synthesis". In "New developments in DSP design tools", Michael Parker - DSP Product Planning Architect at Altera, discusses the benefits of Model-Based Design with MathWorks MATLAB and Simulink, and how designers can use Altera's DSP Builder to implement matrix processing cores to perform floating point operations in FPGAs. The DSP Resource Guide also includes my editorial on "DSP, FPGAs, and the quest for instant gratification", the "Forward Thinking" column from Will Strauss, President & Principal Analyst at Forward Concepts, and a "Military Insights" column by Robert Hoyecki, Vice President of Advanced Multi-Computing at Curtiss-Wright Controls Embedded Computing. Strauss reviews some of the latest developments in 4G and the mobile-wireless industry in "The small-cell base station market is getting bigger". Hoyecki discusses the importance of the Serial RapidIO (SRIO) interface, and how his company utilized IDT’s PCI Express (PCIe) to SRIO bridge to enable designers to employ SRIO with Intel processors, in "SRIO reaches a crossroads in Intel-based DSP designs". Virtex-7 2000T from XILINX, Inc.
TMS320C553x Series from Texas Instruments, Inc.
HSPA+ software libraries for the CEVA-XC DSP core from CEVA, Inc.
Zynq-7000 Software Developer Bundle and System Creator Bundle for Cadence Virtual System Platform from XILINX, Inc.